In a time and place only slightly removed from now, PINA, the world’s largest tech company, has introduced society to a new product called “Port.” This irresistible space-time travel device is mysteriously powered by nostalgia and longing: Step inside a Port and find yourself transported any place your heart desires, real or imagined. Earth’s population plummets when many who pass through its portal don’t come back—either unwilling or unable to return. 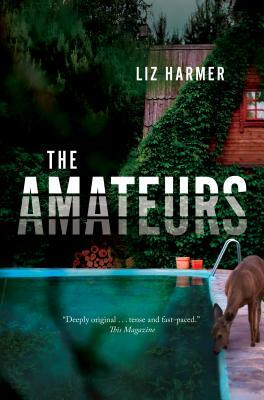 In The Amateurs, Liz Harmer has crafted a subtle, many-faceted debut novel about rapture and romance—and the strange, dark, powerful alchemy that happens when technology meets desire. LIZ HARMER is working on a second novel, and a story collection, which was a finalist for the 2014 Flannery O'Connor Short Fiction Award. Her stories and essays have been published in The Malahat Review, PRISM, Grain, The New Quarterly, Little Brother and other journals. She won a National Magazine Award in Personal Journalism and was nominated for another NMA, both in 2014. She was longlisted for the CBC Short Story Prize and a finalist for a Glimmer Train Prize, and was on the editorial board at echolocation between 2013 and 2015. She holds an MA in Creative Writing from the University of Toronto, where her mentor was Charles Foran. She has also studied with David Bezmozgis, Richard Greene, Robert McGill and Richard Bausch. Raised in Hamilton, Ontario, she now lives with her husband and their three young daughters in southern California.